Deric's MindBlog: A stark graphic - the income gap continues to widen. A stark graphic - the income gap continues to widen. The NYTimes piece by Patricia Cohen and graphic summaries by Ashkenas are worth reading. 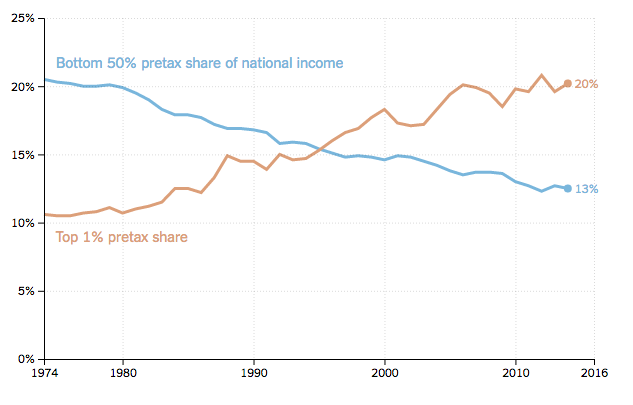 The top 1% and the bottom 50% have swapped their relative shares of the national income. Forty years ago, the top 1 percent of earners took home 10.5 percent of the total national income, and the bottom half earned 20 percent of it. By 2014, those percentages effectively flipped, with the top 1 percent earning a 20 percent share and the bottom half dropping to 12.5 percent.